Five minutes somehow turns into 20. A quick check of Facebook and the next thing I know I’ve wasted nearly half an hour I had planned for something else. Or, I sit down to watch my favorite show on TV, but end up watching two or three. Not just a half hour break, but now two hours gone and it’s time for bed. Does this sound familiar? We’re all so busy and the days just seem to slip away. How do we find time to add anything new, even if it’s important? As I stepped into this series on prayer, I worried how would I find the time to really dig deep and experience the prayers. I wanted to know them well before I wrote about them, yet I didn’t think I could find the time to commit. I knew it would take a commitment of 20-30 minutes of daily prayer at least, but I typically only have a few minutes here and there for prayer (often as I’m driving). I knew I’d need a quiet place and time to focus and listen for God, yet my house is always abuzz. How could I practically improve my real life prayer time? We’re all busy, but how we spend our time is a matter of choice and priority. Somehow I make time to check Facebook and email regularly. I make time to catch my favorite shows on TV. So, why couldn’t I make time to spend with God in prayer? Isn’t He so much more important than Facebook or TV? I had to be intentional about setting aside time for prayer, making an appointment with God. For me, it’s been a half hour in the early morning, before the rest of house is awake. I took this from my morning writing time, but I knew starting the day with prayer would be so much more important. So, what will you choose? How will you be intentional about your real life prayer time? Maybe not a half hour, but what time can you commit to an appointment with God? Jesus gives us a good example of praying deep the night he prayed in the garden of Gethsemane. Here he prayed his most fervent prayers. He prayed for quite a while that night, probably several hours as we see him admonish the disciples three times for falling asleep. What did Jesus pray about for so long? I’m sure he covered a lot with God that night, but the point of that night’s prayer was to accept God’s will as his own. Isn’t that what our prayers should be too? Even when we bring our requests to God, the request really is to bring our hearts in line with God’s plans around each of those requests and to help us be open to His answers. We also learn from Jesus why it’s so important we stay grounded in prayer and continue to pray deep. As much as we want to follow Jesus and live according to God’s will, it’s hard and we’re faced with temptations every day. We need to stay in prayer to help us be focused on God’s purpose for our lives. 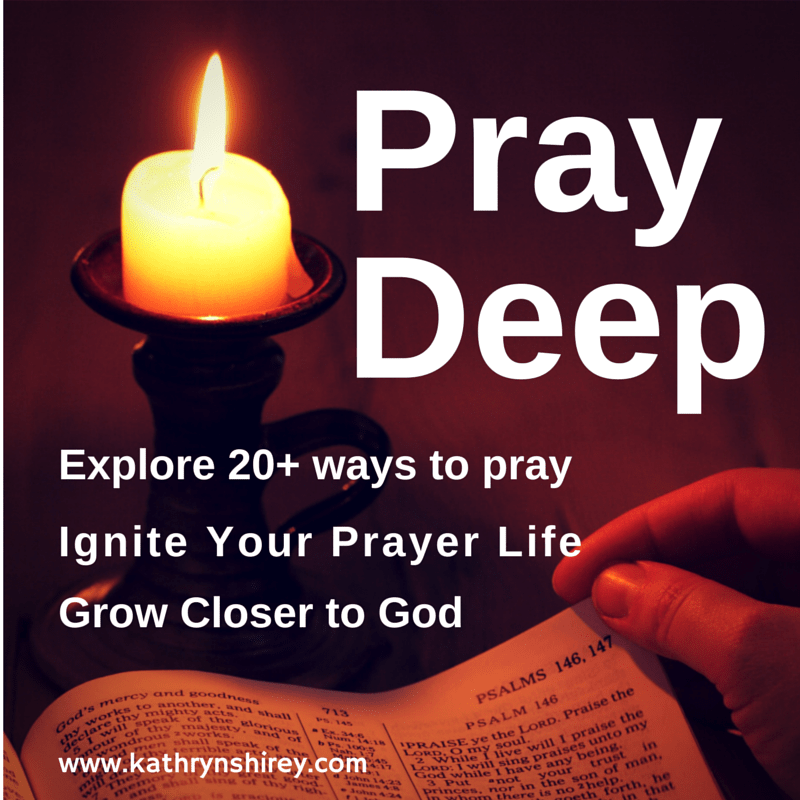 What does “Pray Deep” look like for me? As we conclude the Pray Deep series, I thought I’d share a glimpse of how I’ve been using these prayers. I discovered I pray better when I use different methods. These different experiences and utilizing different senses and thought patterns keep me engaged and listening for God’s word in fresh ways. I like praying from the week’s lectionary scriptures, so I’ll often start the week by looking up the verses and reading through them. It gives me a chance to pray through the scriptures before I hear them in church, which I’ve found enhances my Sunday morning experience. Some mornings I’ll write prayers from the scriptures or journal what I’m hearing from God through the verses. Another morning I may decide to pray through doodles or color a mandala. This is one of my favorites. I may write out verse from the day before, phrase by phrase, committing its words to my heart. Or I may write out my prayer requests and spend time praying over each of them. Maybe the following morning I’ll walk the labyrinth. I have one printed on paper to do a virtual walk. I trace the path with my finger and allow God to speak to my heart. Some mornings I’ll just sit with my prayer request list and pray over each name and each need. No matter the method I choose for my daily prayer, I’ll always pray over the names on my prayer request list and then usually close with a prayer from the Book of Common Prayer. I have a selection of them printed as prayer cards and I’ll rotate through them. Through this discipline of prayer and exploring different ways to pray, I’ve transformed my view of prayer and grown my relationship with God. I look forward to my morning prayer time and often wish I had more time for prayer. I find that prayer has become intertwined throughout the rest of my day, a part of who I am. My challenge to you is this. If I can set aside time for prayer, then so can you! How will you be intentional and choose time for God? Your real life prayer time will look different than mine. It may be at a different time of day, for more or less time, with different choices for prayer methods. If you’ll be intentional, though, and commit to pray deeper, I think you’ll also find a renewed relationship with God and a deeper love of prayer. PRAY DEEP CHALLENGE: Decide how you will make prayer a focus. How will you carve out time for prayer and take your real life prayer life to the next level? Start today! What a wonderful post! I think we all can improve our prayer life. I love doing an art prayer journal. Drawing helps me talk to God about things. Lately I have been on my knees praying for my husband and my marriage. Thank you, April! I’ve found such a love for art prayers. I’m not very artistic, so have been surprised how much I love this form of prayer, but it really helps focus my thoughts and prayers. Saying a prayer for you this morning – for you, your husband and your marriage. May God lift you up and carry you through whatever storms life has brought your way. Sometimes that’s the best prayer we can pray. God, help me, because without You, I’m not enough to walk through the trials of this life. I think we’re only able to grow closer to God when we can pray this and ask for help. Prayers for you today, Mimi! Much love and Happy Easter weekend! I have enjoyed this series on prayer and all the different tips, suggestions and insights you have shared. Thank you! One way that I have found I can be challenged and meet that challenge is in the quiet of the morning coming to the Lord to just rest in His presence. I don’t want to get up early and every morning I find myself barely getting out of bed. My husband gets up early and it is TOO early for me, but the Lord has prompted me to get up with my husband and see him out the door. When I do this, I am more awake and ready to meet with the Lord inthe quiet before everyone else is up. It is literally my most productive time of the day when I just sit in the presence of the Lord! 🙂 go figure, right? I never regret meeting him in the early or late hours. I’m so glad you’ve enjoyed this series on prayer. I’m really sad to come to the end, although excited to see what God has in store next 🙂 It’s amazed me that even as I’ve given up writing time for prayer, I’ve been more productive in the time I had remaining. Starting the day with God (whatever time of day – you probably wouldn’t like my 4am start ha!) just gets the day off to the right start and gets our focus where it needs to be. I’ve enjoyed your series on prayer, Kathryn! Good job! I still hope to go back and read yesterday’s I missed some. One thing I like to do is to write prayers down, which you mention too. Many days I pen a one sentence prayer based on my take away from the scripture passage I read, and then I try to remember to pray it later at points in the day. Thanks, Betsy! This one has been so fun to write and so impactful personally. I’ve loved trying out all these prayer techniques myself – and finding so many new ones that I really like. It’s completely rejuvenated my prayer time. Love the idea of taking a one sentence prayer from scripture and keeping it with you all day. Happy Easter to you and your family! Thanks, Tai! I’m so glad this series has connected so with you. Happy Easter! Another wonderful post on prayer, Kathryn. No matter what our prayer time may look like, one thing remains constant – we must be intentional about prayer. It always amazes me how distracted I can become when I set out to pray. Thank you for each suggestion. May you & yours have a most blessed Easter! Happy Easter to you and yours, too! Loved this series, Kathryn! It is an intentional choice on our parts as to whether we make time for prayer or not. I have learned a lot about the different choices I have in my prayer time and also that making this choice daily is a gift. Blessed you linked up at The Weekend Brew. Happy Easter! Thanks, Mary! Being intentional about my prayer time and exploring so many aspects of prayer has really been impactful for me too. Happy Easter! Thanks for the challenge and all the great ideas. My word for this year is Pray! so I appreciate hearing from others about how they make prayer a priority in their lives. I am so glad that I found this prayer series. You have great, creative suggestions on prayer and meditation! God bless and thanks for sharing!